It is with great joy I announce the good news to you that, thanks in no small measure to the readers of Spitalfields Life – the 576 letters of objection that you wrote and more than 500 of you who came to join hands – the Tower Hamlets Strategic Development Committee unanimously rejected British Land‘s proposals last night and Norton Folgate is saved. Two years ago, we were able to save a pub – the Marquis of Lansdowne - from demolition, but now we have saved a whole neighbourhood! 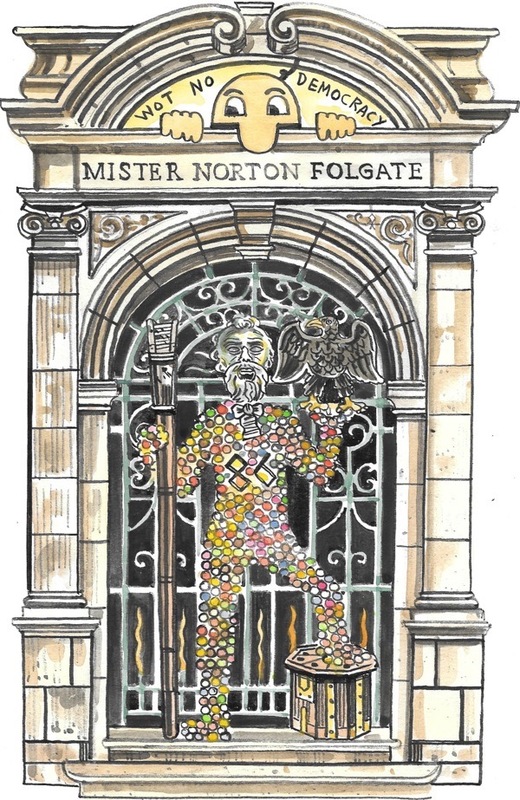 In celebration, Contributing Artist Adam Dant has drawn this portrait of Mister Norton Folgate himself, constructed from details sketched in the streets, and this is accompanied with a eulogy in verse. the respect due to Norton Folgate. as defenders of Norton Folgate. the good person of Norton Folgate. Three cheers now for Norton Folgate! A victory for the people and the city. Well done. Wonderful news. Congratulations from New York. I wanted to join hands around my block in support! Wonderful to join hands and meet new friends on the day, and now to see the victory! A fabulous result. I love what the combined energy of people acting with integrity can do. So pleased to hear this great news. Well done to all those involved. Well done Gentle Author. You really will have to tell us your name soon so that it can be recorded as one who was instrumental in saving much of the heritage of London. Thank you. From Portugal, CONGRATULATIONS! Power to the people. Corporate greed can and will be overcome. Excellent work. A massive victory for the people up against the bully boys. Thank you Tower Hamlets Strategic Development Committee for seeing through the hyperbole of British Land last night. WELL DONE! Let’s hope that the rejection withstands the inevitable appeals. Congratulations! Wonderful news. I hope to visit the area soon. What an excellent result…I am so grateful, gentle author, for your part in galvanizing the effort to preserve this piece of London heritage–which happens to be mine as well as of so many others. Thank you, thank you, thank you from ‘across the pond’ to all who participated. Congratulations to all.Future generations will be grateful for your foresight and dedication to the cause. Oh well done . Congratulations to all of you who got off your proverbials and fought the good fight . Fantastic. Oh the best news. What a wonderful way to start the day by learnibng that sense has prevailed over hard nosed business . Totally fabulous news. And well done to yourself and all the others who made it happy….make sure you celebrate this “properly” please. Well done to all involved on this victory! Now, are we all ready to go up against Boris Johnson directly if he tries to overrule as he did with the Fruit and Wool Exchange? Congratulations!That is brilliant news,really Apart from being a pain in the neck,Boris Johnson is turning out to be a bigger vandal than Attila the Hun! Your wonderful news has enriched my morning. Oh frabjous joy! It just shows that things can be changed if we care enough. The Fruit & Wool Excange was lost, in spite of the local authority ruling in its favour. Will BL appeal to Boris? Will Boris listen to BL or to you? Well done everyone involved in this fight, and well done the planning committee. GA, please keep us informed about what happens now …. is this the end of the story? Amazing news. Thanks for mounting such a great compaign and thanks too to all the people who supported it. Power to the people. That is fantastic news! What a credit to Spitalfieldslife and everyone who campaigned to save this wonderful historic district. My hat goes off to you all. HURRAH!! Power to the people, what a triumph! Congratulations and thank you (on behalf of my ancestors) for those who could be there in person. Hopefully any appeal is dismissed by Secretary of State. If anybody can get intelligence regarding the Inspector’s site visit date if an appeal goes ahead, there could be another human chain? Further to that, if this decision sticks, British Land will seek to neglect the buildings further, as they have the Nichol’s and Clarke warehouse and associated terrace facing Bishopsgate. However, Tower Hamlets do have enforcement powers. Tower Hamlets can also issue urgent works notices requiring preservation of unoccupied buildings in conservation areas, and they can carry out the required works recover the costs from the owners if British Land lets them dilapidate. There are also powers to issue a s.215 Notice under the 1990 Planing Act to clean up a tidy site, including tarting up a tired facade and roofscape. Get ready for the next battles of Norton Folgate. Wonderful news. Congratulations from Western Australia. Yippee !!! So, so , so pleased to read todays Spitalfield’s Life. Fantastic – thank you & thanks to all those who stood up to this terrible proposal. Lots more to do & quickly. Wonderful news! Well done to absolutely everyone involved in this campaign. We’re now looking forward to a gentle tidying up. This is brilliant! Bloody great, well done one and all. Gentle Author of course, and very much well done to all the other people who have given up their time to do the long, boring and laborious work involved in organising this. Heroes. And well done all of us who added the smaller but also essential elements of registering objections and spreading the word. Congratulations everybody and thank you Gentle Author ! What a victory and how reassuring to know that our voices have been heard . Brilliant news to start the day with – gives me much encouragement to keep on working to save my own neibourhood from the ever present threat of greedy developers! Wonderful news! Congratulations to all footsoldiers. I’ve come over all shouty – WELL DONE!!!! Great work and its lovely having good news for a change. Firstly, great news – it’s heartening to see how a relatively small number of people can make a difference. Secondly, it takes someone to coordinate that effort, so a big ‘well done’ to you GA and all your colleagues and thirdly, this will not be the end of it – to misquote Jefferson, “the price of (the) liberty (of Norton Folgate) is eternal vigilance” – they’ll be back…. Great news. Wonderful. At least one piece of old London saved. V! Wonderful news. Congratulations on a fabulous campaign. Such wonderful news to wake up to!! Congratulations to everyone involved! Thank you so much from all of us – you have restored our faith in People over Pounds. This is splendid news! May all the ragged worts retreat to scratch their scabs forever. Well done!!! Wonderful to wake up to good news. I’m absolutely delighted. Congratulations to all, especially The Gentle Author. 19th July 2015 was very special. Well done everyone, but don’t drop your guard because they will try again,they always do. We are fighting a development in our town which has been rejected several times are yet they are trying again. That is terrific news,I am so pleased to to hear that all the effort and hard work has paid off.!!!!!! Wonderful news – I was walking through the area only this morning, thinking to myself how sad it would be if the developments went ahead. So it is lovely to see this article! That is wonderful news! Congratulations, and well done, GA and everyone involved. Good to see that taking action really can make a difference. Tremendous news!!! – but (from bitter personal experience) I agree with the comments above about the possibility of appeal. In our own (very small) case, the developers cynically used their enormous resources to threaten the local authority with the extra expense of further appeals and the possibility of its having to pay all costs, and the planning committee just caved in. But in the mean time, enjoy the victory! Thank you Julian Bond for the Madness link. Brilliant news. Now it’s necessary to be ready for any appeals. I truly hope that any future development can work in harmony with the area rather than destroy it or glass it over. Now we must all remain vigilant, so that this kind of inapropriate plan can be opposed again, as and when it reoccurs ! Today is my birthday and I will toast you all, in the greatest admiration. What bliss it is to be alive…at a time when we can do something positive to make a difference. Cannot express how good this makes me feel. There are many other battles looming, and we need to take on Boris the Destroyer, but there is hope. Well done all of us. And thank you to the Gentle Author for being so vigilant. And to all of those other people who worked so tirelessly to keep things going. Hurrah! I wasn’t able to join the hand-holding but I’ve been busy posting and tweeting in support of Norton Folgate. Congratulations to everyone for this wonderful success. Wonderful news! Thank you GA and all involved in this fine piece of work. I must visit the place in the coming weeks. They will return for another attempt because they have no idea of the difference between cost and value. Three cheers and a resounding huzzah! I am coming to London this weekend so I will have a triumphant stride around this noble area. You are now part of the history of this great city. SUCH an important achievement! It doesn’t seem enough simply to say “Well done!”, but well done nonetheless to everybody involved. It makes me wonder just exactly what may NOT be achieved by solidarity? Well done for the right response to all the hard work of the organisers involved in saving Norton Folgate from a completely inappropriate development. A biff on the nose to all those money grubbing speculators! Truly a “good news” day! Well done, all. I hope everyone will now have time to enjoy a bit of summer relaxation–just in case there are follow-up ‘battles’ yet to be won. British Land won’t go away without a fight. One battle won but the war is still to be won. A great result – well done to all, from one who has saved a few places in Somerset. But remember that we have a government that dines behind closed doors with the likes of British Land, and dismisses ‘little people’, and their human-scale solutions. So stay alert to the invasion of the suits (it is rather like one of those ’50s B-movies, isn’t it!). What are the odds on a new proposal that retains only the facades – ‘zombie’ buildings? thank you all. never, never, never, never give up. congratulations to everyone involved! A huge victory! Congratulations from Toronto. I admire and appreciate the concern you have for the long-term livability of your neighbourhood and of London, and your willingness to fight for it. HIP HIP HURRAH ! HIP HIP HURRAH! HIP HIP HURRAH! I’m delighted at this news. My congratulations to all who worked so hard to achieve this decision. Gentle Author and Norton Folgate for ever! Thank you. My heartiest congratulations to all involved. What a creative and inspired effort! My face lit up when receiving your daily email this morning, Gentle Author. I imagine all of East End London was one brilliant light this morning, hopefully to continue for a long, long time. Thank you Londoners and people who care, for your effort to save your neighborhood and your community and the world’s view of this part of your City. Your heritage has been preserved. You should feel very proud of that accomplishment. I am particularly proud to read of it. THE BEST NEWS , congratulations to everyone involved! Thanks to you, G.A, and the power of the humble blog. I salute you! You succeed in the gentlest of ways and I’m very proud to call you my friend. Brilliant news! It is because of the Gentle Author I was alerted to write letters of objection. Thank you. It with great pride that I leave my own message of complete happiness as the Battle of David and Goliath was given its only out come, it being right and just. I attended the long and interesting planning meeting last night at the town hall that was packed. The councillors saw sense, with me a campaigner within this ever growing movement. All we wish is for the good of the Historic Liberty Of Norton Folgate it our neighbourhood with all of the surviving historic buildings saved from demolition and for their sensitive and complete restoration. Future generations to come will remember this and thank us. Congratulations from a Canadian fan of Spitalfields Life. A worthy and successful effort by all. Hooray! I’m sure British Land has gone back to the drawing board for their next evil plan, or perhaps they have finally gotten the message of what the locals want in redevelopment. Hurrah from me too and congratulations on winning the first battle. May you now win the war which will no doubt follow, we will still all do all that we can to overcome British Land!! A hearty congratulations for all your efforts. From someone who lives in the North of England, but adores the Spitalfields area and all the history over the centuries surrounding it. `well done. Well done!! All strength to your arm for any further campaigning! Norton Folgate lives to fight another day. CONGRATULATIONS. Thank you for leading the fight. So wonderful, and encouraging, to see the developers not getting their own way. So thrilled by this wonderful news. Wish I could have been there but was en route from holiday. Many, many thanks for all your efforts with a fantastic campaign, from me and my Old Nichol ancestors! Just brilliant. Knowing my visits to Spitalfields won’t be spoiled..
3 cheers for Dan Cruikshank. 3 cheers for The Gentle Author. Congratulations to all from Canada! Inspiration for all. Well done Gentle Author and to all involved with campaign. I was proud to be there to join hands around Norton Folgate on Sunday a remarkable event and to hear of the great outcome at last nights council meeting. Delighted to see that democracy worked! Whilst this victory is wonderful news, I fear the fight may not be over and hope that British Land do not appeal or that Boris does not overturn the decision. But I will remain vigilant and will be down to the area again and make my opposition known and to do what needs to be done in the future to secure the liberty of Norton Folgate. 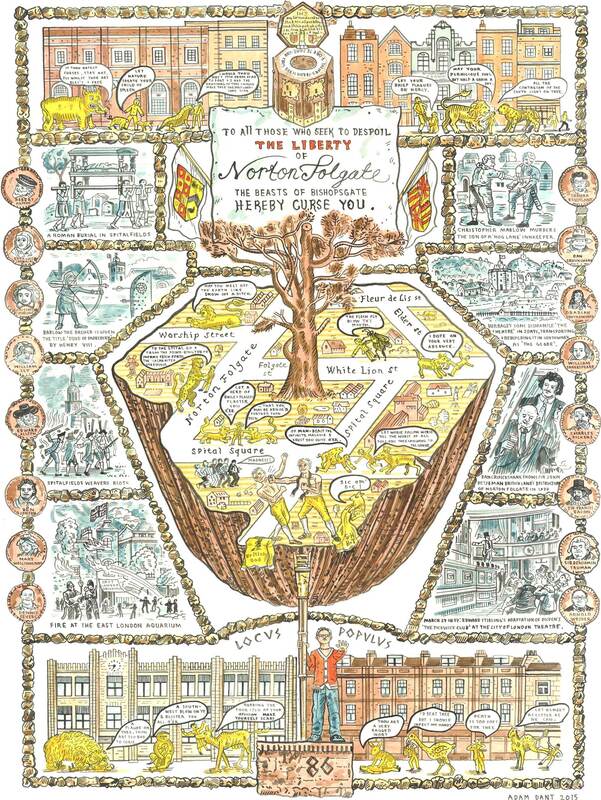 Fantastic!, not just a triumph for Norton Folgate but triumph for liberty and democracy. Fantastic. We have run a small business in the Spitalfields area since 1997 and seen the area swallowed up by highrise towers. Gone are the netball pitches, the artists studio’s and craftsmen and women who made this area so vibrant and so alive. I feel that this is a victory for them!!!! The fight is on, and the battle is not lost………. Not sure if you’ve had high praise on this occasion from the Land Down Under, but here it comes!! United we stand! Your smiles must be ear to ear! I was checking Twitter waiting for the news with butterflies in my stomach as I felt that no one could possibly agree to demolishing such a clearly beautiful place but also knowing the power of cancerous organisations like British Land. I didn’t know which way it would go. I gasped out loud with sheer joy when I saw the news. I am overjoyed and can’t wait got visit it soon. Thank you to you, and everyone involved in saving this beautiful piece of our heritage – you are a total inspiration. Fight the good fight, and don’t give up. I fear this is the battle but the war on the vandalism of London will never be over so here’s to future battles and wars! Delighted with the result. Congratulations to all those who took direct action to save such an important area. Hopefully, it will show others what can be done with grass-roots activism for other local groups , and their battles to come in preserving the character of their part of the city. Great result. But I wonder what the next move will be by the would-be developers. At least the council have woken up to what’s at stake.